Pillow, one of the most essential item in our life, has much more function than we thought, physically or emotionally. We collected 11 innovative and functional pillow designs from the world. Writing your thought, providing you tissue, playing music, working as alarm, glowing in the dark, simulating your boyfriend’s hug … want to know more? Just this this post. How many times has it happened that you thought of something in the night before going to sleep and forgot it the very next day? Well, with this write on pillow, I bet, such an event won’t occur again. It sounds great but my only concern is how comfortable is pillow is! Comfort-U Total Body Support Pillow Designed by a registered nurse, the Comfort-U® Total Body Support Pillow molds itself to the shape of your body to cradle you in complete comfort from head to toe. This extraordinary pillow surrounds you in a cocoon of support, relieving pressure to many areas of the body, which drastically reduces your need to toss and turn. You get uninterrupted, restful sleep. The Comfort-U is filled with a premium fiberfill, so it’s always soft and fluffy, totally hypoallergenic and the cover is machine washable. The Comfort-U is great for relief from: maternity discomforts, fibromyalgia, arthritis and osteoporosis pain, back, neck and shoulder pain, restless sleep. 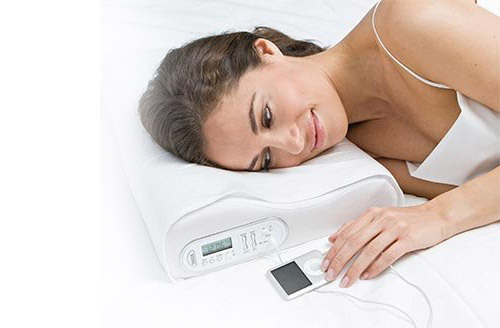 The Comfort-U is also ideal for general pampering! You would like to cry? So, play up! 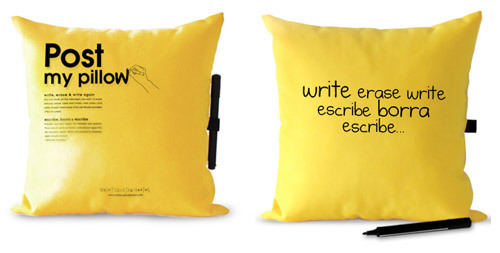 With cushion ThenCry you have the permission to howl heart-breakingly, to just weep your heart out. It´s a cushion with integrated, refillable Kleenex-dispenser. The cushion is washed and is washable. The perfect gift for all crybabies, for those suffering from heartache or for trashy novel readers. 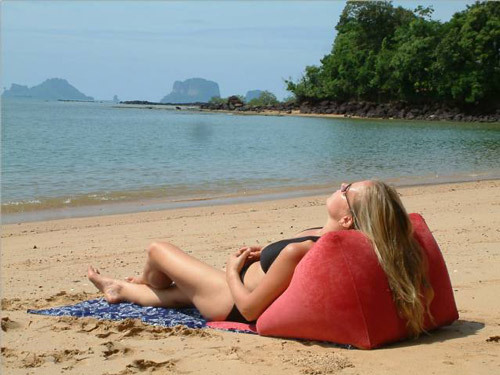 WondaWedge Inflatable Outdoor Beach Back Chair Pillow. The WondaWedge is a new outdoor product enjoying great success. It is an inflatable outdoor chair / pillow with a ground sheet, perfect for the beach, picnics, camping or anywhere outdoors. Designed by two physiotherapists, has great ergonomics with a back-support function and is good for the posture. The WondaWedge has three different angles giving you three different positions: sitting up, reclining and lying down. It is lightweight and inflatable, easy to carry and easy to use. The WondaWedge with anchoring groundsheet is a new outdoor inflatable chair / pillow product designed by physiotherapists with great ergonomics and a back-support function. My Brest Friend is the only pillow that stays securely in place and does not shift or slide like other crescent shaped pillows. It provides support, comfort and security to both mom and baby, making breastfeeding more enjoyable and successful. 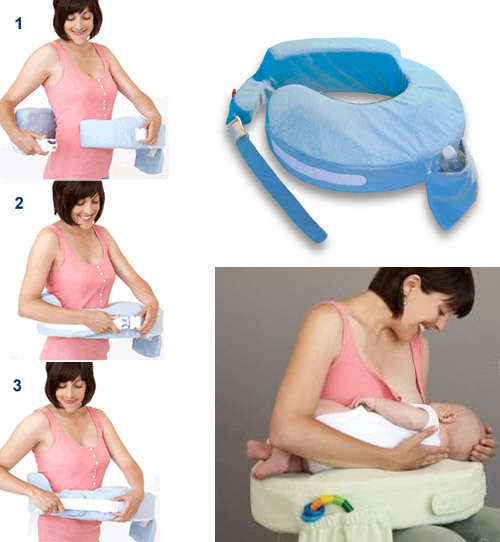 Features: Deluxe Fabric – Extra soft plush material Back Rest – Helps you maintain good posture during feeding, preventing sore backs and necks Wrap-Around Design – Secures to the body, helping mom and baby maintain ideal positioning and latch-on Arm and Elbow Rests – Eliminate shoulder stress Convenient Pocket – For nursing and other accessories Firm, Flat-Front Cushion – Eliminates gap between you and your baby, which keeps the baby from rolling in or away during breastfeeding Breastfeeding Ease – Flat-top firmness ideal for positioning baby Adjustable, Silent-Release Strap – Deluxe strap has Velcro and silent release buckle for easy, one hand use. Wrap yourself up in the Boyfriend Body Pillow. The Boyfriend Pillow is a soft and pleasurable body arm pillow that resembles the torso of a big strong man with a comforting arm that cuddles you. Feel his safe and warm embrace while comfortably resting on his chest. This fun and cozy snuggle pillow is great for people whose partner is away on military leave or work absence. Single?s who wants to feel the touch of a man without actually having to have one love it too. 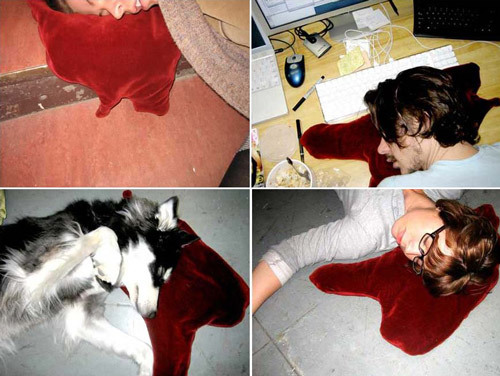 This novelty pillow makes a great gift for a friend or relative with a good sense of humor that would love to have a little more cuddling at night. 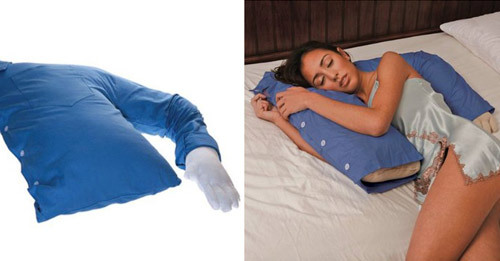 You will love how this boyfriend arm pillow is so soft and warm, and the way that he wraps around you and holds you all through the night with out saying a word. It is as if he knows exactly what you want. 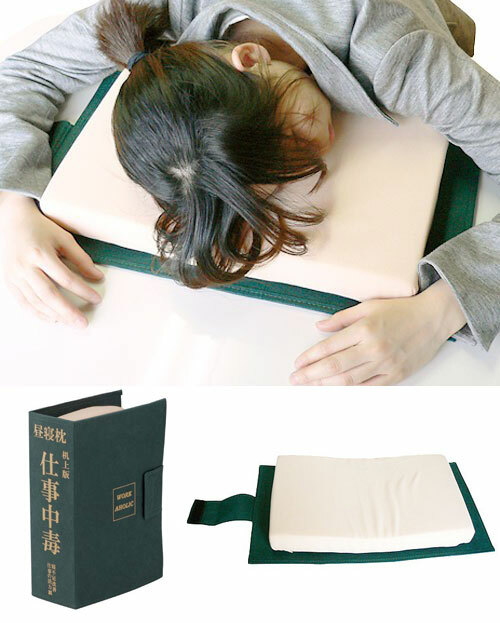 It is a, uh, pillow that looks like a book. Perfect for students who like simulating learning. Now you can listen to your favorite music while you’re falling asleep and waking up on your plush memory foam contour pillow with built-in clock. Featuring 8 pre-programmed relaxing nature sounds to lull you to sleep, or plug in any MP3 player, and the built-in personal speakers allow you to hear your music at the sound level you choose. The pressure-relieving memory foam contours to the curves of your neck and spine. For the ultimate night’s sleep, imagine the luxurious comfort of this memory foam pillow combined with the ability to musically fall asleep. 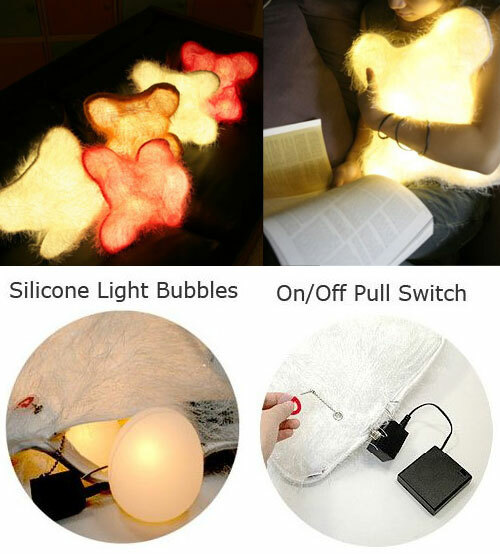 Great to use while working on a laptop, or just relaxing and reading in bed. Only Sharper Image® can bring you the cushioning support of memory foam combined with personal music speakers and alarm for an unprecedented sleep experience. This one is so lovely. Next story Suitcase Stickers, Creative or Crazy?